Among the few latest additions to the monumental beauty of Allahabad, this temple, has been built strictly in accordance with architectural specifications in the scriptures. It is built with beautiful pink stone from Bansi Mountain range in Bharatpur District and pristine white marble from Makarana in Rajasthan. Exquisite carvings adorn the structure. 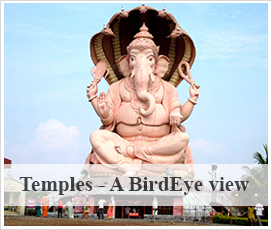 The design and the architectural excellence of the temple has received International acclaim. In the sanctum sanctorum is the Siva Linga made out of black marble and a captivating Life-size idol in white marble of the Lord in meditation in His full glory. Just outside the sanctum sanctorum there is a three feet idol of Nandeeshwar made of black marble, facing the Lord in utter devotion. There are idols of Mother Parvati on the left side and Lord Vighneshwara on the right side. 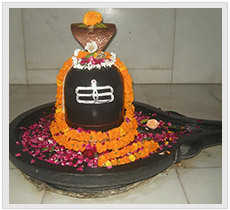 Shree Akhileshwar Mahadev is located in Chinmaya Mission Ashram in Rasoolabad Area of North Allahabad about 6 Kms. from Allahabad Junction Station and 2 Kms. from District Court. Adjascent to the temple is a beautiful rose garden and well maintained park dotted with fruit trees of different varieties. Construction of Shree Akhileshwar Mahadev commenced with the laying of foundation stone on 30th October, 2004 by Pujya Swami Tejomayananda, Swami Subodhananda & other senior Swamins of Chinmaya Mission. Shree Shiv Swarup Agrawal (Now Swami Yogasthananda) was the mukhya yajman. Consecration (Prana Prathistha) of the idols and inauguration of the Temple complex was spread over five days from 19-23rd February, 2009 with 108 Kalashas in the presence of Pujya Swami Tejomayananda & thousands of devotees coming from all over India. The total cost of the project was over Rs. 2 crores. The temple remains open from 6 A.M. to 12 Noon and from 4 P.M .to 9 P.M. everyday.